The dark blue State Flag of Kansas features a central image of the seal of state which is topped by a sunflower. The flag serves as a symbol of honor, heritage and regional pride and is displayed at state buildings. 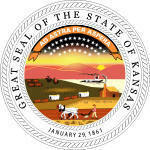 The Kansas State Flag is also flown on national and state holidays and on any other days proclaimed by the governor. There is a strict Order of Precedence for flags. State Flags are displayed in order as they entered the Union. modified in 1927 and 1963. Car Flags are often displayed to represent of an individual's allegiance to their state. Kansas State car flags are used by their owners as mobile emblems of their home. Car flags are usually made from strong materials and are attached to a car via a pole and clip window attachment. What is the design of the Kansas state flag? What does the sunflower symbolize? What is the history of the Kansas State Flag? It was originally designed in 1925 but between 1925 to 1927, Kansas used a state banner, which consisted of a large sunflower and the word "Kansas" on a blue field, instead of a flag. 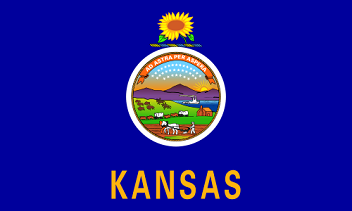 The word "Kansas" was added to the bottom of the flag in 1961. The Kansas flag is kept and used as required by the code specified in the constitution of the state.